Over the past year, Stirling has been adorned with woodland carvings on a variety of historical subjects, thanks to the creative programme of the Stirling Council Ranger Service. 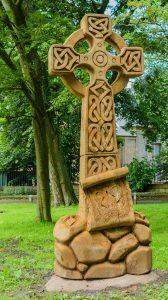 The latest wood carving, near the Stirling Smith Art Gallery and Museum has been erected in honour of Christian Maclagan (1809 – 1901), Britain’s first woman archaeologist. Christian made it her life’s work to record the Pictish and early Christian symbol stones throughout Scotland. Her linen – backed paper art works are now part of the British Museum’s collection, because of the prejudice she experienced as a woman archaeologist here in Stirling. Chainsaw artist Iain Chalmers has sculpted a fine tribute, with the archaeologist’s tools on either side of the cross, and a sheet of paper being unfurled up the sculpture, ready to take the impression. Unlike previous works, this is in cedar and is not an on-site carving. Born in Denny, Christian Maclagan spent most of her life in Stirling. A woman of independent means, she was from a deeply religious family and joined the Free Church after the Disruption, funding the building of it in St Mary’s Wynd. She published many articles and a few substantial books on archaeology, but was refused full membership of the Society of Antiquaries. She is buried near the Lady’s Rock in the Valley Cemetery, where her gravestone has one word, CHRISTIAN carved in Greek. A beautiful memorial to a clever woman who should be better known throughout Scotland. I took 40 members of Stirling Rambling Club to see it at the end of our walk ….on 3rd Jan. 2018 ….and it looked splendid in the afternoon sun.